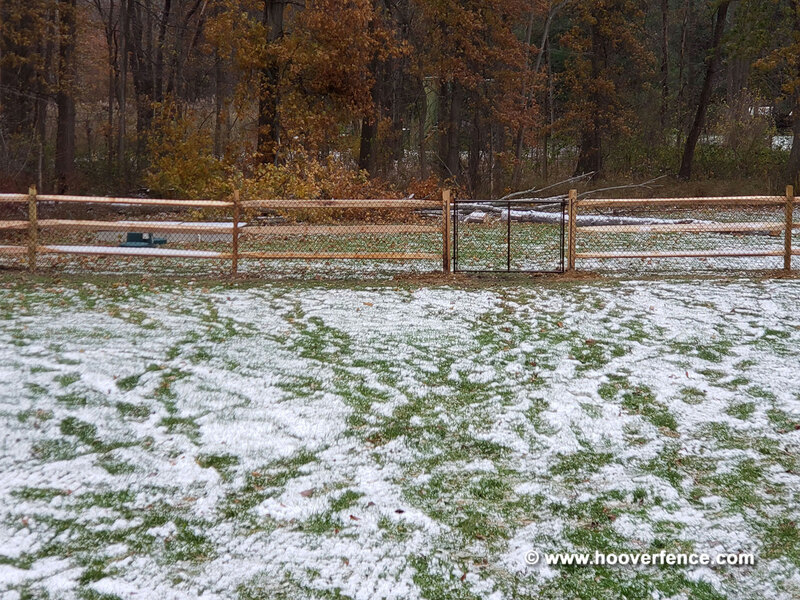 9 Gauge x 2" Chain Link Fence Fabric, Color Coated | Hoover Fence Co.
9 gauge vinyl coated (PVC) chain link fence fabric is a great choice for residential fence projects. 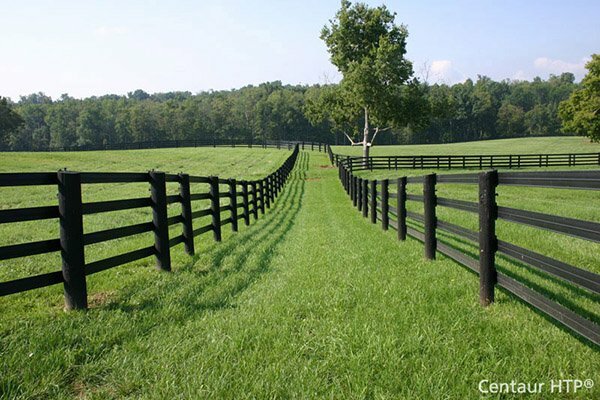 This option allows customers to choose a fence that will accentuate siding, roofing, and trim colors on houses and business. Some choose the colored option because it will blend into the natural surroundings. Available in Black, Brown, Green, and White. 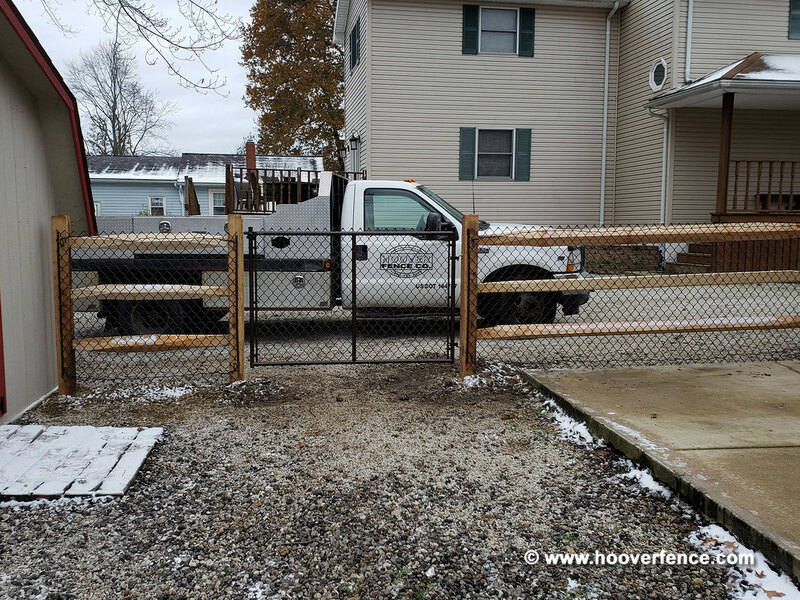 Many customers will also use an ornamental aluminum or vinyl fence for the front of their properties, and use the more economical chain link fence for the backyard. 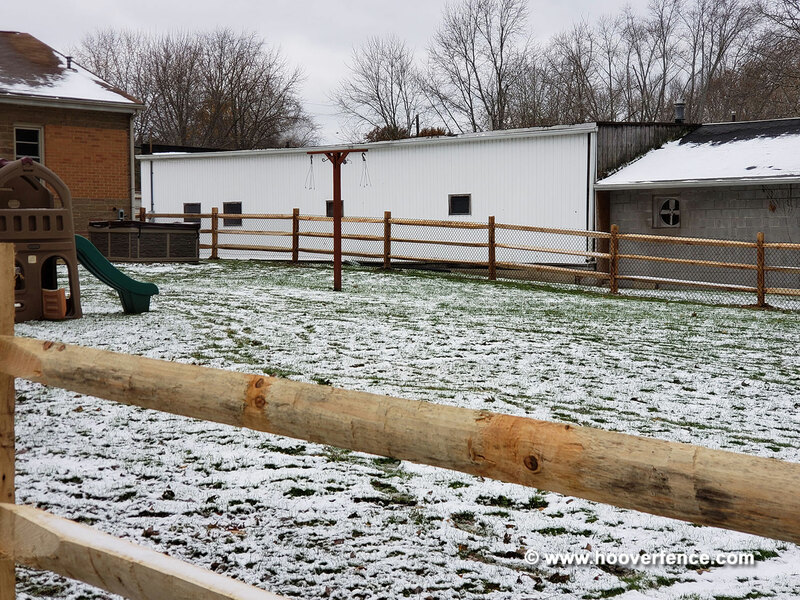 The smooth nature of the materials lend itself to a backyard that is safe for playing children. We offer a full line of colored framework, fittings, and gates to match the fabric. Customers may also choose to pair the colored fabric with galvanized framework, which is also common practice. An added benifit of this material is that the core wire is galvanized, then the material also has PVC extruded over the wire which adds an additional protective layer to the steel wire. This adds to the longevity of the materials. Volume discounts provided on full pallet quantities (9 rolls). KxK Selvage = Knuckle x Knuckle (Chain link top and bottoms are bent over). KxT Selvage = Knuckle x Twist (Chain link is twisted at one end to form two barbs, while the other is bent over). 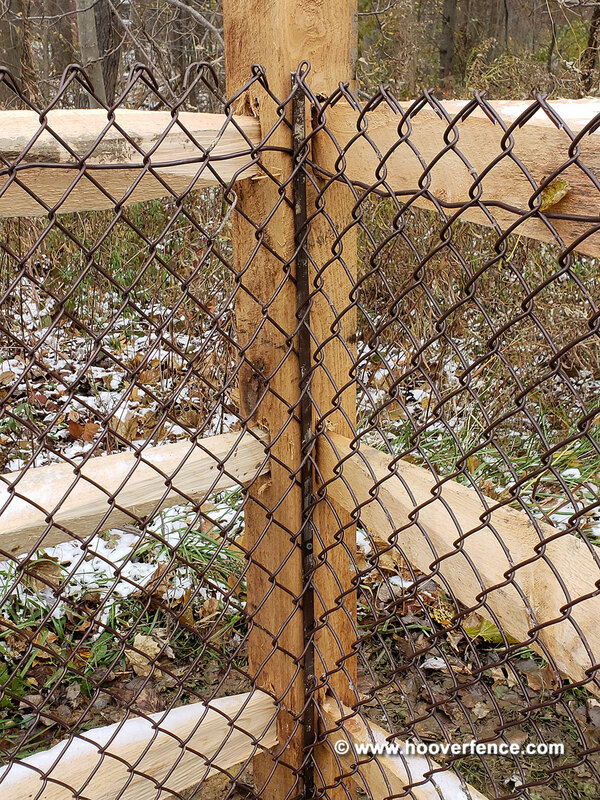 Vinyl Extruded chain link fence fabric has a steel core wire that is about 12 gauge. A heavier duty option would be extruded and bonded. This uses an 11 gauge core which after coating, finishes out at an 8 guage finish. A last option which is special order would be fused and bonded. This is typically used in heavy commercial or industrial projects. What is the difference between 'Extruded' and 'Extruded and Bonded'? In layman's terms, Extruded Vinyl, when cut with a knife, can be peeled off like a banana. However, it does not peel easily. Extruded and Bonded Vinyl is also adhered to the wire and would have to be cut off completely, much like peeling a potato. Extruded costs less than Extruded and Bonded. About mesh size: The galvanized fabric mesh for 11-1/2 gauge measures 2-1/4". The 11, 9, and 6 gauge galvanized mesh measures 2". Mesh size is the measured distance between two parallel sides (see illustration). Note about gauges: The smaller the number, the heavier the fabric; henceforth 9ga. is heavier than 11ga.. We recommend 11ga. for residential jobs and 9ga. for commercial jobs. Heavier gauges are not only stronger, but have a better finish; The heavier the gauge the longer it may be 'hot-dip galvanized' to prevent rust and corrosion. Rolls are supplied with an additional link for weaving onto another roll of material if over 50' is needed. On the flip side, a full roll can easily be trimmed down by un-knuckling (un-folding) the links on the ends and spinning the link out to one side of the roll. 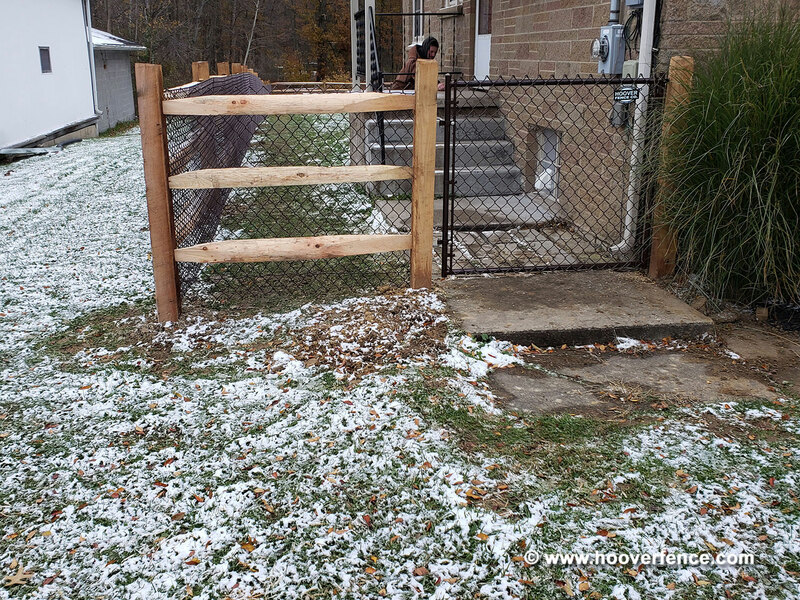 Here are some photos of a recent installation where we paired a brown chain link fence with West Virginia Lap Rail in order to contain the homeowners dogs while maintaining the rustic look of the split rail fence. 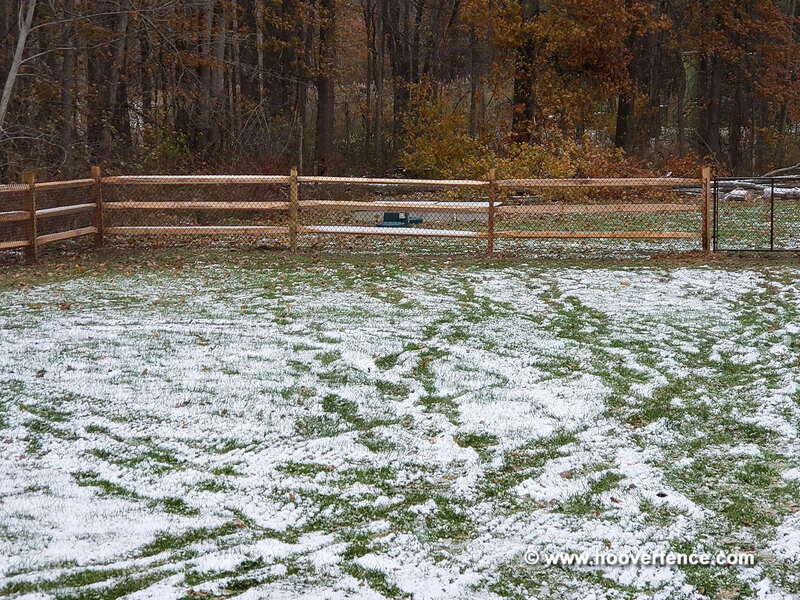 The brown chain link compliments the wood installation and provides the added security for this special situation. 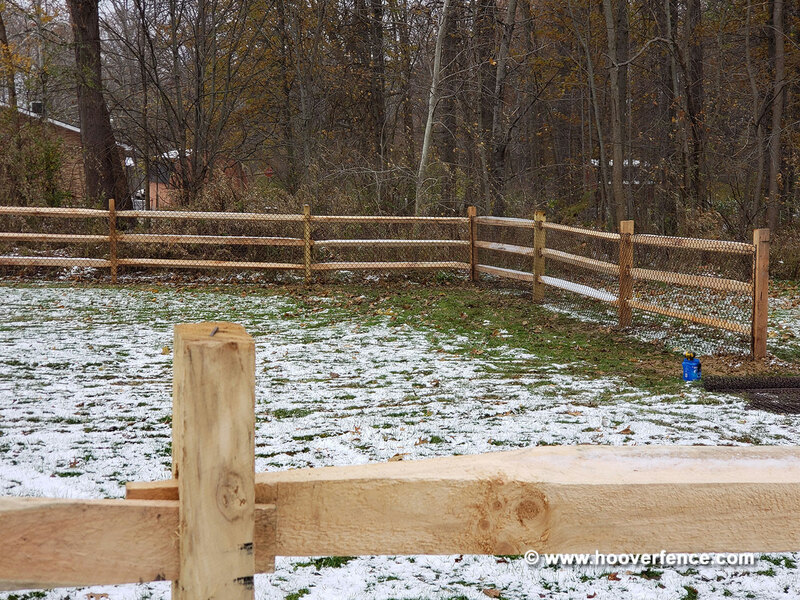 This is a great example of the versatility of both chain link and split rail fence styles.